Heat the oven to 400°F. Beat the egg and water in a small bowl with a fork. Season the chicken with the thyme and black pepper. Heat 1 tablespoon butter in a 10-inch skillet over medium-high heat. Add the chicken and cook for 10 minutes or until well browned on both sides. Remove the chicken from the skillet. Cover and refrigerate for 15 minutes. Heat the remaining butter in the skillet. Add the mushrooms and onion and cook until they're tender and the liquid is evaporated, stirring occasionally. Stir in the parsley. Stir the cream cheese and mustard in a small bowl. Sprinkle the work surface with the flour. Unfold the pastry on the work surface. Roll the pastry sheet into a 14-inch square. Cut into 4 (7-inch) squares. Spoon about 1 tablespoon mushroom mixture on each square. Top with the chicken. Spread about 1 tablespoon cream cheese mixture on the chicken. Brush the edges of the pastry with the egg mixture. Fold the corners of the pastries up over the chicken and press to seal. Place the pastries seam-side down onto a baking sheet. Brush with the egg mixture. Bake for 25 minutes or until the pastries are golden brown. 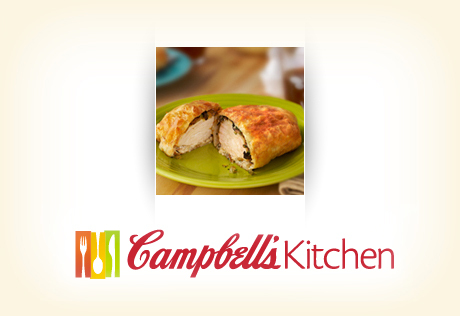 Ingredient Note: We develop our recipes using a 4-to 5-ounce skinless, boneless chicken breast half per serving. However, there are a range of sizes available in-store, from the butcher counter to the meat case and the freezer section. Use whichever you prefer- just follow the recipe as written above for the best result. If you're using larger chicken breasts they may require a little longer cooking time.